Barnet striker Liam Hatch has completed his £150,000 move to League Two rivals Peterborough United. The fee for the move, which was announced last week, is payable over the next two-and-a-half years. The 25-year-old, who had also been a target for Shrewsbury Town, has scored eight times for the Bees this season. 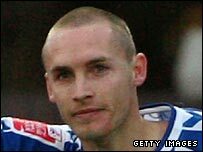 Hatch, who joined Barnet from Ebbsfleet United for £23,000 in July 2003, recently rejected a new contract offer at Underhill. Barnet chairman Tony Kleanthous told his club's website: "I am really sorry to see Liam go as he epitomises the spirit of our club. "I understand why he wants to move on and make more money - we attract players as we are honourable when they get the chance to better themselves." Hatch made his Posh debut as a substitute in their 2-1 win over Shrewsbury on New Year's Day. Barnet have moved to replace him up front by signing Cliff Akurang from Histon.